The Fourth Judicial District Commission on Judicial Performance recommends, by a vote of 6 to 1, that Judge Thomas L. Kennedy BE RETAINED. Judge Kennedy was appointed to the District Court in May 1999. Prior to his appointment, Judge Kennedy was an attorney in private practice primarily in the areas of criminal and civil litigation. From 1983 to 1984 Judge Kennedy was a deputy district attorney in the Fourth Judicial District. Judge Kennedy graduated from the University of Colorado School of Law in 1982 with honors. He also received his undergraduate degree from the University of Colorado. Judge Kennedy is active as the chair of the Board of Directors of the Pikes Peak YMCA. He is also an active member of the Board of the El Paso County Bar Foundation. The Commission conducted a personal interview with Judge Kennedy, reviewed opinions he has authored, reviewed his performance in the courtroom through observations, and reviewed surveys sent to both attorneys and non-attorneys. During his most recent six year term of office, Judge Kennedy’s average scores have continued to increase, with a combined average score of 3.53 (on a 4.0 scale). Of all attorneys surveyed about retention, 79% recommended retaining (55% strongly recommending retention) 15% recommended not to retain, and 6% made no recommendation. Of non-attorneys surveyed, 96% recommended retaining (91% strongly recommending retention), 2% not to retain, and 3% made no recommendation. (These percentages may not add up to 100% due to rounding.) The non-attorney retention recommendation is significantly higher than the statewide average of 88% average for all District Court judges. Judge Kennedy is consistently rated above the statewide averages for District Court judges in all categories. Judge Kennedy has presided over domestic, civil and criminal matters as a District Court judge during his time in office. 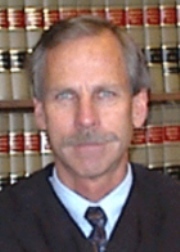 He also presides over a juvenile court docket, and served for 3 ½ years as the District Court judge in Teller County. While he is considered “strict” in his courtroom, he receives above average scores in the management of his cases and his courtroom docket by attorneys who appear in front of him.